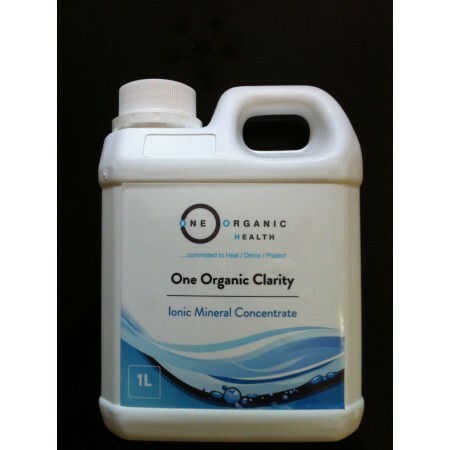 One Organic Clarity is a solution of purified mineral water with ionic sulphate minerals that are an extraction from trace mineral-rich Rock Formations. Our mineral solutions and water contain the following ionic minerals. Additionally contains100 trace minerals Aluminium , Chromium, Cobalt, Copper , Germanium, Lanthanum, Lithium , Molybdenum , Nickel , Rubidium ,Scandium , Selenium , Silicon , Sulphur , Titanium , Tungsten , Vanadium, Zirconium. As a natural substance the mineral content can vary slightly. Dilution rate for OneOrganic Clarity is 1 to 1000 meaning 1ml treats 1 litre of water. A teaspoon treats approximately 5 litres of water. This 32 oz bottle treats up to 1000 litres of water. Depending on the quality of your water it may take additional amounts of One Organic Clarity. For the best results wait 24-48 hours after treatment to complete the agglutination process. Why are One Organicminerals so powerful? One Organic Minerals are sourced from Black Mica. Our minerals are based on natural fresh water and the natural state of fresh water ecologies. OneOrganic minerals are extracted from the stone that supplies sulphates to springs and the salt of the ocean. Adding the minerals to water starts a process by which the oxygen in the water is changed into activated oxygen .Activated oxygen burns up invisible contaminants making them visible and water insoluble or filterable. The magnetic force of the minerals attracts contaminants , gathering them together onto large size particulates that are heavier than water, causing them to sink to the bottom. Minerals are necessary to activate the enzymes in your body . Sulphate ionic minerals are known to support enzymatic functions throughout the body. Not all minerals are created equally. If minerals are not in the correct form they can build up totoxic levels in our body. What form of minerals does the body absorb and use most readily and efficiently? What do you want for your water? Caution: Do not use without properly diluting this product as instructed. If accidentally wallowed without dilution , drink plenty of water. If product gets into the eyes immediately flush with water. If irritation persists please seek professional medical advice.